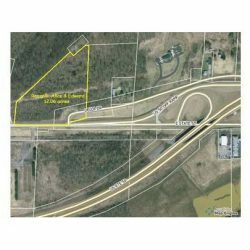 This 12.06 acre site is an ideal commercial development property, zoned ‘B-3’ for restaurants, an office complex, bank or other retail opportunities with 600 FT. of frontage on the north side of East State Street and three traffic lanes up front for easy access plus additional frontage on Della Drive. The East State Street ramp exits at this property giving it high visibility from US 50 and it is only.5 miles from Holzer Medical Clinic. It already has two approved curb cuts, all utilities are available at the road, as well as 19.59 additional acres across the street.